What is that Clump of Leaves in the Tree? It is winter and the leaves have left the trees bare. At first sight there is not much besides the bark and branches. A closer look reveals a clump of leaves and sticks that is messy and quite large in appearance. Upon further investigation, it appears to be a grey squirrel nest. Grey squirrel nests are most noticeable in the fall and winter. Squirrels prefer to live in deciduous trees such as oaks and maples. 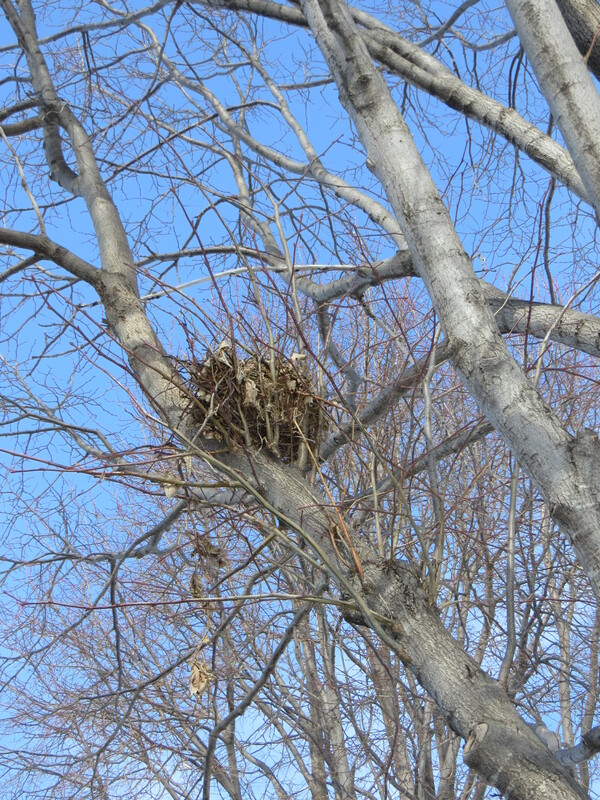 The nest is made in the crotch of a tree near the trunk. The base of the nest is assembled first through the overlaying of small sticks. Leaves are stuffed between and on top of the twigs to make nest more compact and secure. 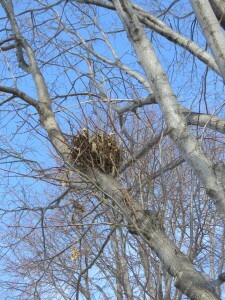 Once the base of the nest is made, more twigs and sticks are added around the outside of the base. The outside of the nest is reinforced with leaves, smaller twigs, and moss. 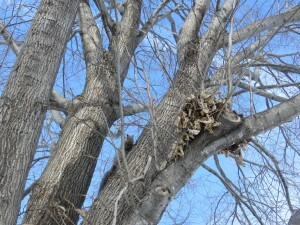 Lastly, the inside of the nest is lined with leaves, bark and other vegetation. When the nest is finished it is safe and secure. Grey Squirrel nest at the crotch of a tree.